An indispensable additive that contains more than 80 bioactive enzymes. These in the substrate accelerate the degradation of dead roots. Reduced organic material is converted to carbohydrates more quickly by adding the Sensizyme fertilizer. Advanced Nutrients Sensizyme cleanses the root system of old and inactive roots, thereby preventing the development of certain diseases, ensuring better absorption of nutrients, and facilitating the growth of new roots and beneficial microorganisms in the substrate. In addition, they also promote growth and flowering and contribute to higher yields of the plant. A strong and healthy root system is the basis for the rapid and proper development of the plant. Enzymes released in the Sensizyme fertilizer are up to 3X more active than competitive fertilizers, provided by Advanced Nutrients. Sensizyme are selected high-quality bioactive enzymes that over time do not lose their power. Using the Advanced Nutrients Sensizyme you will be able to use the same substrate several times. 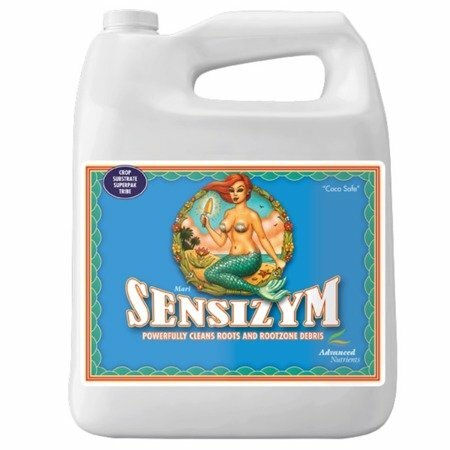 Sensizym is completely compatible with all pH Perfect® and non pH Perfect® Base Nutrients along with all competitors Base Nutrients and Supplements.